Winning in 2012 is precisely what’s at stake, and the presidential speech was the vehicle for candidate Obama to emerge as a hopefully winning combination of two former Presidents. Ronald Reagan of the political right and Bill Clinton of the center, the optimistic Great Communicator and the opportunist Great Triangulater all in one. 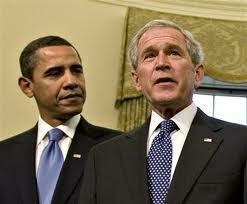 In foreign affairs, add a third predecessor, G. H. W. Bush, a conservative ³realist² in international matters. Given the deep split in the Republican Party between the old line right wing, which controls the majority of the obstructionist GOP caucus in the Senate and House, and the hard line Tea Party far right extremists, Obama evidently thinks that “rational conservatism” — once associated with GOP moderates before they became extinct — is his ticket to win the next election. But judging by the political content of Obama’s speech — his soaring nationalist oratory about the superiority of America and its people, and glittering generalities about what he intends to accomplish in the next six years — the only serious winners in 2012, as in 2008, will be big business, big finance and big military. The White House team obviously decided that in these troubled economic and political times Obama’s most productive approach to the State of the Union message would be a sanguine recitation of the good news, ignoring most of the bad news, and focusing on national unity, a bright future at home, and America’s continued world leadership — if only we pull together. The New York Times noted with understatement that “The speech was light on new policy proposals.” Indeed, light as a feather. The president did not seem to possess specific plans, or the hint of adequate financing, or the political backing to attain any of these objectives. How could most of them possibly succeed under such conditions, especially when the government has just entered its third year with an annual deficit of nearly 10% of GDP while tax breaks for the super rich have just been extended, and neither of the two ruling parties has the fortitude to raise taxes? At the same time, the component states of the union are going broke, though that never made it into the State of the Union address. For instance, New York State Gov. Andrew Cuomo announced Feb. 1 that his state was “functionally bankrupt” as he proposed draconian cuts in the education and Medicaid budgets. Most of the states and the Federal government seem to be largely compensating for the Great Recession — brought about by the bankers, financiers and their political enablers — by slashing services for the working and middle classes and the poor. In addition to these problems, of course, there’s also dangerously high unemployment, millions of foreclosed homes, increasing poverty, an educational system in decline, a decaying infrastructure, tattered social safety nets, an expanding war in Afghanistan, a Pentagon and national security budget of over a trillion dollars a year, and increasing environmental destruction exacerbated by impending climate change. In only one instance did Obama proffer the semblance of a concrete plan, and enthusiastic Republican votes will make it possible: “I am proposing,” Obama told the assemblage, “that starting this year we freeze annual domestic spending for the next five years. (Applause.) Now, this would reduce the deficit by more than $400 billion over the next decade (sic), and will bring discretionary spending to the lowest share of our economy since Dwight Eisenhower was President. This freeze will require painful cuts.” The pain assuredly will not be felt by the rich. The main focus of Obama’s address was on jobs, which he mentioned 26 times without once uttering the word “unemployment” or “jobless.” Officially, unemployment in February is 9% but when part-time workers who need full-time jobs are included, along with “discouraged” workers who have been seeking employment so long they have given up, the real total is double that figure. The President spoke with sympathy about workers unable to find employment and spent time explaining some of the factors behind the lack of jobs, including international competition, the need for more sophisticated skills, high technology innovation, and American capitalism’s switch from manufacturing to more profitable service industries. He did not mention the accelerated class war declared over 30 years ago by big business and its political supporters against American workers and the union movement that resulted in the stagnant wages, diminished benefits, weakened pensions, and job insecurity that made the sudden impact of the Great Recession much worse for many working people. For all the words devoted to jobs, Obama managed not to put forward a jobs program. Since the White House will not propose another economic stimulus, much less consider a crash federal jobs program to directly hire the unemployed, he seems satisfied to provide additional tax incentives for businesses to begin hiring again, coupled with the promise of an impressive future infrastructure building program that probably won’t get of off the ground. Most U.S. businesses are doing quite well. Profits in the third-quarter of last year increased at an annual rate of $1,659 trillion, said to be “the steepest annual surge since officials began tracking such matters 60 years ago.” Nationwide profits have increased 12% in the last three years. The Dow cracked 12,000 in January, partly in response to Obama’s State of the Union promise to overhaul the corporate tax system, which corporations believe will enhance their profits. Yet, many American companies remain very slow to hire additional workers. Why? Leonhardt continued: “For corporate America, the Great Recession is over. For the American worker it’s not.” He doesn’t expect unemployment will drop below 6% for at least five more years. The President’s address was perhaps more important for what he left out than what was included. Obama omitted any mention of global warming, though it was a repeated theme in the 2008 campaign and was included in last year’s State of the Union. True, the antediluvian climate-change deniers in Congress and Republican voters get apoplexy when it is mentioned — but that’s no reason to cave in. It is all the more reason why he should use his bully pulpit to enlighten the American people about the scientific argument regarding climate change. Significantly fewer people today believe climate change is a danger compared to five years ago, according to the polls. President Obama mentioned Rep. Gabrielle Giffords — who was shot in Tucson two weeks earlier in a massacre that left six dead, including a 9-year-old girl, and 14 wounded — at the beginning of his speech. He also said “the dreams of a little girl in Tucson are not so different than those of our own children, and that they all deserve the chance to be fulfilled.” But he refused to say a word about tightening gun laws, though that, too, was one of his election issues. Commented Paul Helmke, president of the Brady Campaign to Prevent Gun Violence: “How can President Obama tell us [about the child] without talking about the gun violence that destroyed those dreams?” He evidently doesn’t wish to aggravate the gun lobby and Republican voters. Obama also left out such words as “poverty,” “hunger,” or “homelessness” to reference the nearly 50 million poor Americans, or the word “foreclosures,” lest it would remind his audience that the administration’s foreclosure program is a shambles. On the other hand, the President did mention and justly took a bow for overturning the Don’t Ask, Don’t Tell regulation in the Armed Forces. “Starting this year,” he said, “no American will be forbidden from serving the country they love because of who they love.” (Applause.) As usual, however, he balanced a liberal gesture with a conservative one, when he immediately followed with: “And with that change, I call on all our college campuses to open their doors to our military recruiters and ROTC. It is time to leave behind the divisive battles of the past. It is time to move forward as one nation.” (Applause.) “One nation,” evidently, has no room for dissent or opposition to militarism. The money involved amounts to $1.35 billion this year if it is all given out. In the past only 10 of some 45 states who applied for grants received them. In this connection it is worthwhile to note that Gov. Cuomo is requesting a cut of $2.45 billion in the New York State education budget this year, $1.10 billion more than the entire “Race” funding. Scores of other states and cities are cutting school budgets as well. Only 2% of every Federal tax dollar goes to education, as opposed to well over 50% for the Pentagon and other national security expenses. Aside from the fact that the Federal government is investing far too few dollars and effort into reducing dependency on fossil fuels there is considerable debate within the environmentally-conscious community about the use of nuclear, clean coal and natural gas. Nuclear because a safe way of disposing of deadly wastes remains elusive and also because of the danger of an explosion. Coal because “clean” coal isn’t clean. Natural gas, because while it burns cleaner than oil, it remains a significant source of CO2 in the atmosphere, and also because extracting it will require extremely dangerous fracking (hydraulic fracturing) to meet demand. According to the New York Times “He called for an end to subsidies for oil companies and set a goal of reducing dependence on polluting fuels over the next quarter-century, but without any mechanism to enforce it.” If the subsidies end for these richest companies in the world it will amount to about $4 billion a year for five years. This is out of a projected 2011 budget deficit of $1.5 trillion, and higher in future years — helpful, but a drop in the proverbial bucket. Obama noted that “The Secretary of Defense has also agreed to cut tens of billions of dollars in spending that he and his generals believe our military can do without.”(Applause.) This should not be construed to mean the Pentagon budget will shrink. For years many members of Congress have supported constituent war manufacturer projects that the Pentagon said it didn’t need but which were approved anyway. But with the huge deficit, Congress may okay elimination of unnecessary weapons costing some $78 billion over the next five years. This comes to some $15.6 billion a year, but new “needed” weapons and the other accouterments of war will continue to increase defense spending. The president informed the American people that their “paychecks are a little bigger today… thanks to the tax cuts we passed.” He didn’t follow up by specifying that the paychecks of the millionaire class got “a lot bigger,” due to his administration’s capitulation to the right wing demand to continue Bush’s millionaire tax cuts. President Obama hardly spoke of foreign affairs. But he framed much of his speech around the need to “sustain the leadership that has made America not just a place on a map, but the light to the world.” This is a principal goal of Obama Administration policy: the retention of Washington’s unipolar dominion over worldly affairs at a time when U.S. economic and political power is in decline while other nations, particularly from the global “south,” are rising. Most of his brief foreign remarks referred to America’s propensity for warring against poor countries. “We must defeat determined enemies, wherever they are,” he declared, continuing George W. Bush’s mantra that there are potential terrorists lurking behind every tree. This evidently was not the time to mention that the United States, and the Obama Administration until a few days earlier, supported the dictatorial regime politically and financially. Soon after the speech, the Egyptian people rose up against another dictator that the U.S. defended and financed for decades. When it looked like the masses might win, the U.S. started to change its tune. Both these incidents, and there are more to come, will continue to facilitate the decline of world’s remaining superpower. The Obama Administration is hardly unique in being guided by expediency instead of principle in foreign affairs, and the same rule obtains about what is put in and what is left out of State of the Union messages. It’s an election document, not an honest appraisal, and 2012 is around the corner. Enter Mr. Moderate Republican, all geared up to lead America in doing “big things” once again.